It’s that time of the year and the shopping rush has definitely already started. Slowtrends & AmaElla Lingerie are organising a different kind of shopping experience and we will be hosting it here at 01zero-one. 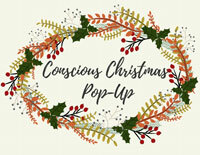 For an Open Day on the 14th December from 10am to 9pm, you’ll be able to pop around and discover very unique gifts, handcrafted goods and ethical products that can make your Christmas and someone else’s brighter than usual. Just with your presence, you will be supporting small businesses that are trying to do things in a more sustainable and sensitive way. We will be collecting donations for drinks and nibbles and profits will go towards supporting Global March’s worldwide fight against Child Labour. Entry will be free and we will also be hosting a Pay-what-you-feel Yoga session with Laura Gaspar in the evening. Some of the brands you will find on the day include AmaElla ethical lingerie, Natasha Rose couture, Ami Iyok natural advanced cosmetics, Sports Philosophy sustainable sportswear, Anna Loucah fairtrade jewellery, Ringana fresh cosmetics and supplements, Flock by Nature organic knitwear, Lyme Terrace honest menswear, BeGood Shop goods, Slowtrends natural candles and more. 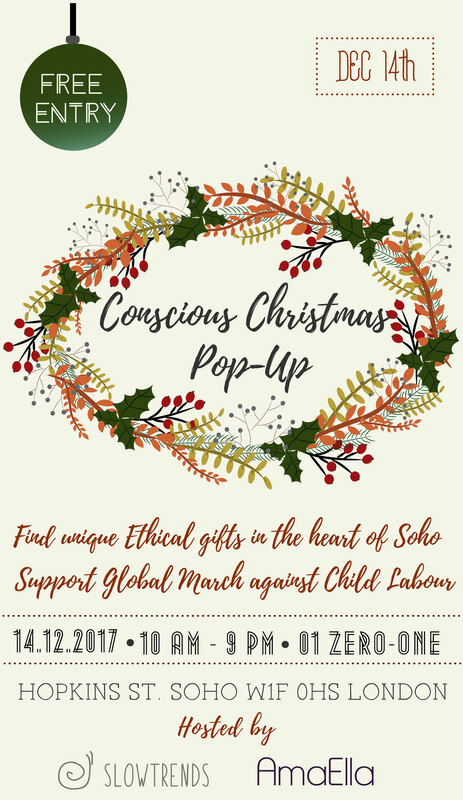 Get away from the High Street on the 14th December and join our movement for a healthier, better slow world.